In the 19th Century, one of the most distinguished stores in San Francisco was The City of Paris. This beautiful and historic building, adjacent to Union Square, reached its demise with the purchasing power of the famous and exclusive, luxury retail store, Neiman Marcus (NM). NM demolished The City of Paris’s building in 1981, even though the California Historical Landmark listed it on the National Register of Historical Places. Fortunately, NM did keep the beautiful rotunda and stained glass dome. Today, lucky diners can sit around the rotunda and eat a meal full of robust flavors and history. 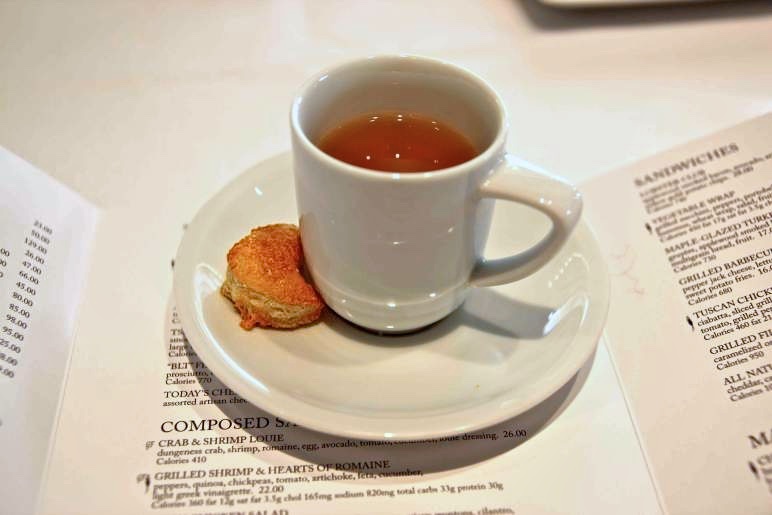 To commence the meal, a waiter delivers a demitasse of chicken consommé on a saucer with a biscuit resting beside it. This tradition has been a part of the NM dining experience since NM opened its flagship store and restaurant in Dallas, Texas in the 1950’s. This soothing broth warms up the palate. 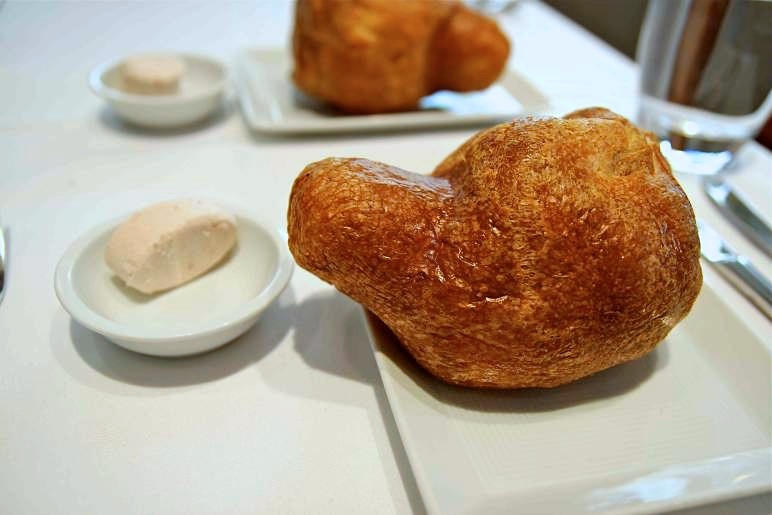 Next, the waiter presents airy and eggy popovers, each the size of two fists, and a side of strawberry butter. We each ordered a salad packed with sweet and salty combinations. For example, the savory chicken salad was paired with seasonal, fresh fruit. 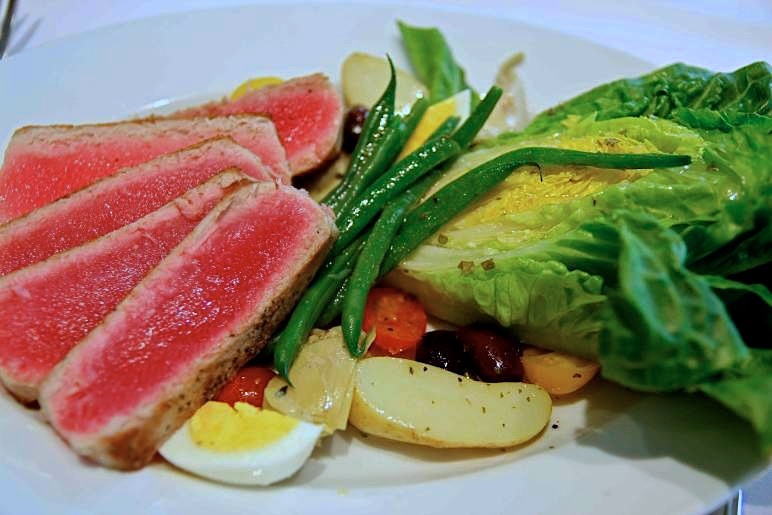 The other salad comprised of seared ahi tuna with little gems lettuce drizzled with a sweet yet acidic vinaigrette. For the grand finale, we had to try the famous chocolate chip cookies. The secret ingredient in these cookies is a teaspoon of instant espresso coffee powder. Still oven-warm and with a good ratio of chocolate chips to cookie, these cookies are ambrosial. So while I’ll definitely skip the $5230 chiffon top that I doted upon as I walked into the store, I cannot say no to these cookies.